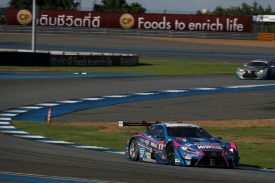 The only overseas event of the 2017 AUTOBACS SUPER GT series, the “Chang SUPER GT RACE” took place at Chang International Circuit in the Kingdom of Thailand on the 7th and 8th of October. It was the 4th year since Chang International Circuit first started hosting the SUPER GT, and many SUPER GT fans in Thailand gathered to spectate the intense battle on the tracks. Before the 39 cars participating in this two-day event rumbled onto the course on Saturday morning, a minute of silence was taken to commemorate the passing of the beloved King Bhumibol. 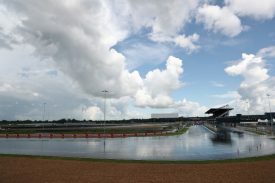 Although the circuit was met with heavy squall prior to the start of the official practice session (10:10-11:50, outside temperature 28℃ / track temperature 31℃), sunshine cast over the tracks by the start of the session, drying it in no time. 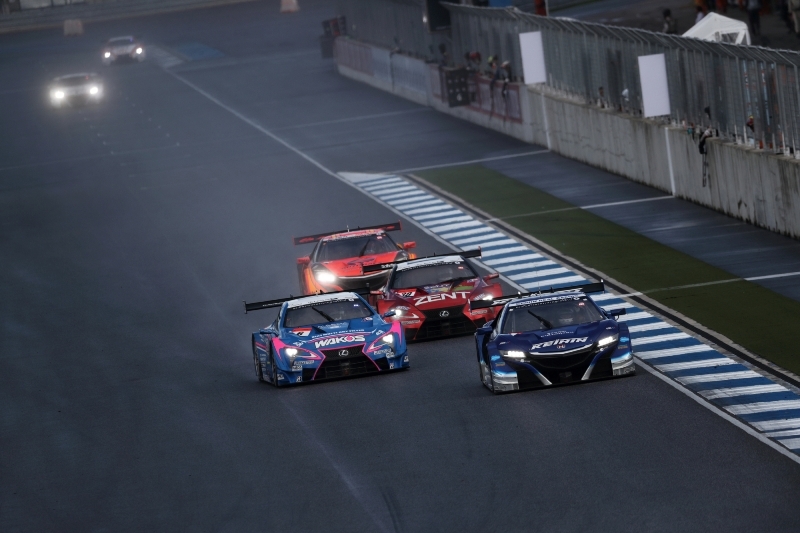 15 cars of the GT500 class and 24 cars of the GT300 class quickly switched to slick tires, and spun off to the course. 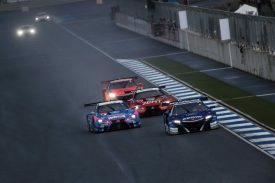 The No.6 car of the GT 500 class, the WAKO’S 4CR LC500(with weight handicap of 48kg) of LEXUS TEAM LEMANS WAKO’S, was boarded by Andrea Caldarelli and Kazuya Oshima, as they made their final adjustments toward the race. Their best lap record for the session was 1’24.247, finishing the session in P3. The day’s event then proceeded to official qualifying. As rain started falling around noon, the tracks were in wet condition. 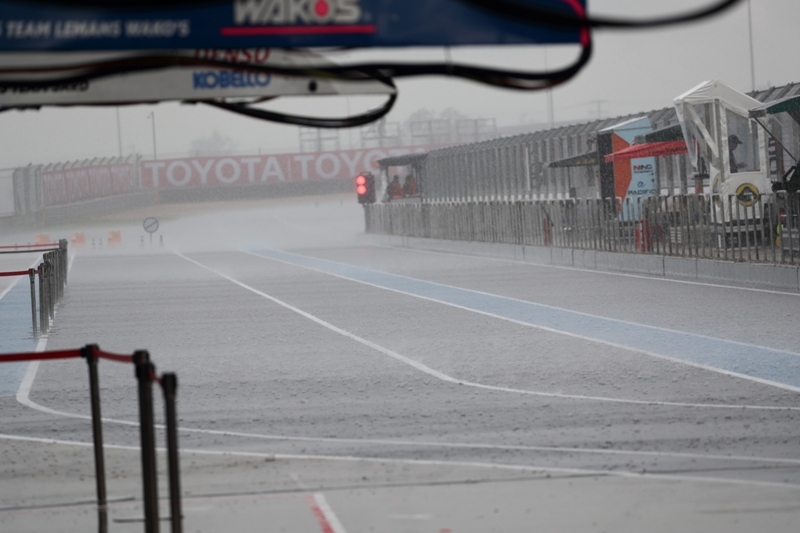 Although the racing line of the circuit started drying during Q1 of the GT300 class, it was not dry to the extent of the application of slick tires in the GT500 class Q1 (15:20-15:30, outside temperature 27℃ / track temperature 29℃). 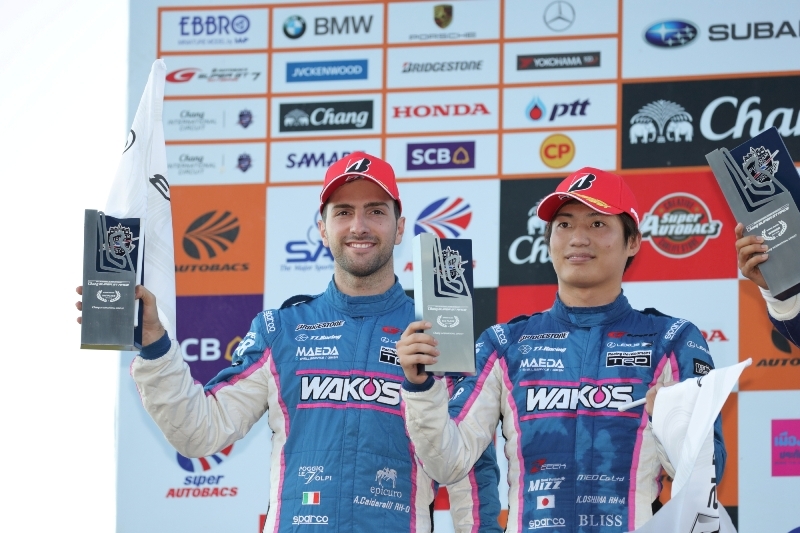 LEXUS TEAM LEMAS WAKO’S first sent Andrea Caldarelli for the speed run. To respond to the expectations of his team, Andrea made an all-out attack on the WAKO’S designed machine. While competitors selected soft compound tires, Andrea elegantly landed a record of 1’29.672, good for P3, on medium tires. The team smoothly progressed to Q2. 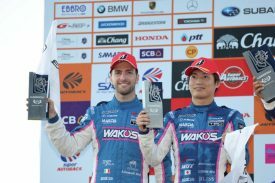 In Q2 (16:05-16:17), Kazuya Oshima, with firm command of the WAKO’S 4CR LC500, recorded 1’25.183, ending the session in P4. Throughout the morning, support races and events were carried out spectacularly, and time was closing up to the 15:00 race start. However, after the 20-minute warm up session around 11:30, just when starting procedures were going to be carried out, heavy rain started pouring over the circuit causing a commotion on the starting grid, as team crew were forced to reevaluate their tire strategies for the 66-lap race which was yet to start. Rain receded in a short while, but the tracks instantly changed to wet condition (outside temperature 30℃ / track temperature 33℃). 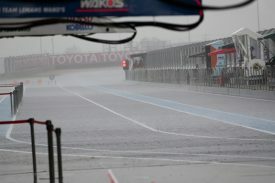 The WAKO’S 4CR LC500 with Andrea Caldarelli on the wheel, made its start on rain-tires and kept its P4 position, pushing as much as possible while keeping an eye on track conditions. The car made its first pit stop on lap 14 when most of the course was fully dried. The No.6 car recovered into the race with slick tires. After 2 laps, Andrea engaged in a heavy charge against a car ahead of him, and successfully overtook his opponent! 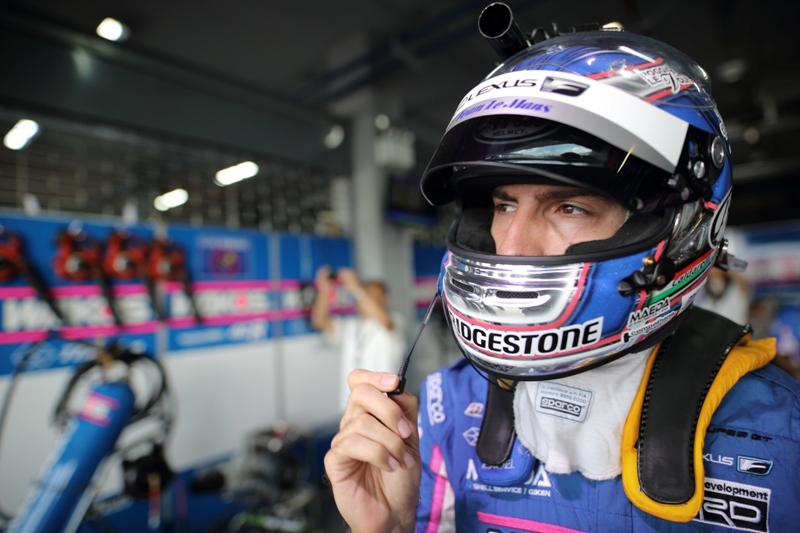 Andrea, newly in P3, continued pushing with a strong pace, recording fastest laps along the way. Andrea finally returned to the pit again after a long stint amounting to 41 laps. 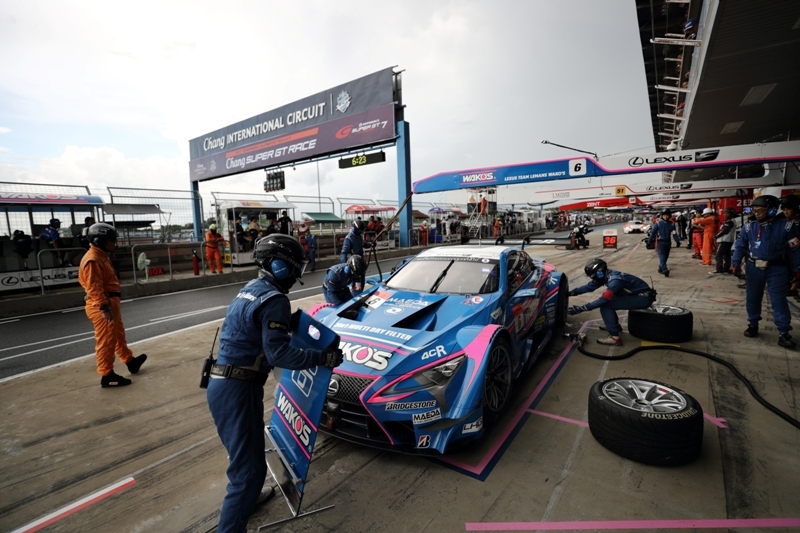 The pit crew performed smoothly by quickly switching tires and refueling, and the WAKO’S 4CR LC500 was handed off to Kazuya Oshima. During this process, car No.6 moved up one position as the car in P3 took a longer pit stop, and Kazuya Oshima started his stint in P2. Oshima, also performed high-speed laps, and was checkered in 2nd place. 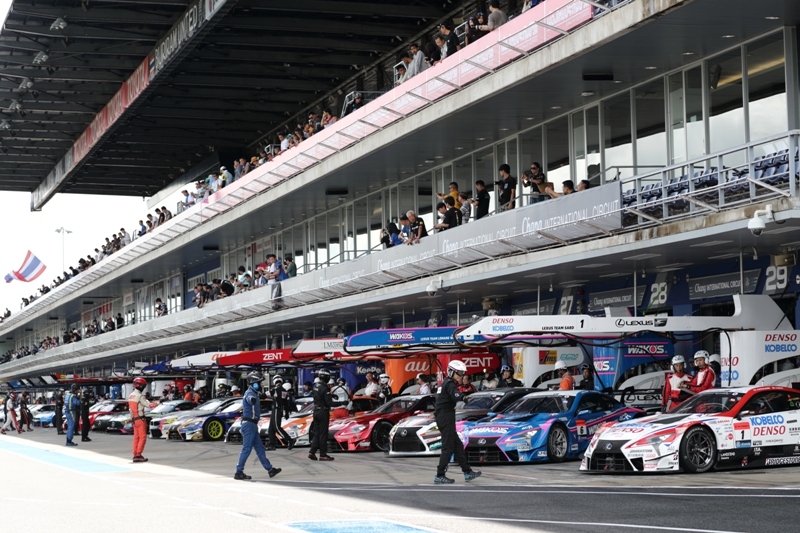 The final race for the 2017 AUTOBACS SUPER GT Round 8 MOTEGI GT GRAND FINAL will be staged at Twin Ring Motegi over November 11th and 12th.